ConocoPhillips Company (NYSE: COP) is an international energy corporation with its headquarters located in Houston, Texas. It is the fifth largest private sector energy corporation in the world and is one of the six "supermajor" vertically integrated oil companies. Its fuel stations are known under the Phillips 66, Conoco, and 76 names. It was created through the merger of Conoco Inc. and the Phillips Petroleum Company on August 30, 2002. Headquarters are in Houston, Texas, in the United States, and offices are located worldwide. The history of ConocoPhillips encompasses the entire history of the development of oil as a source of energy. Conoco was founded in 1875, as the Continental Oil and Transportation Company, to sell kerosene to pioneers in Utah. In 1929 it was acquired by Marland Oil Company, which had developed extensive oil fields and refineries in Oklahoma and Texas. Marland Oil changed its name to Continental Oil Company and the main office was moved to Ponca City, Oklahoma. After World War II, Conoco discovered oil in Libya and Dubai and acquired a network of service stations in Europe to market its gasoline products. It expanded its exploration and production operations to Indonesia, the Gulf of Mexico,Venezuela, Russia and the North Sea; by 1972, Conoco had diversified into coal, chemicals, plastics, fertilizers and minerals, and held more than $2.3 billion in assets. ConocoPhillips is known for its technological expertise in reservoir management and exploration, 3-D Seismic technology, high-grade petroleum coke upgrading and sulfur removal. Research efforts have resulted in new technologies to force additional oil out of older, nearly depleted wells, as well as innovative synthetic and coal-based energy alternatives to oil. ConocoPhillips is currently exploring how to extract oil from new sources, as well as searching for alternative and sustainable sources of energy. ConocoPhillips employs approximately 33,800 people worldwide in nearly 40 countries. As of 2006, its 12 U.S. refineries had a combined crude processing capacity of 2,208,000 barrels per day (351,000 m³/d) (BPD) making it the second-largest refiner in the United States. Based on market capitalization and oil and natural gas reserves, ConocoPhillips is the third-largest integrated energy company in the United States. Worldwide, ConocoPhillips has a combined crude processing capacity of 2,901,000 bbl/d (461,200 m³/d) making it the fifth-largest refiner in the world. It is the sixth-largest non-government-controlled holder of oil and gas reserves. ConocoPhillips is known for its technological expertise in reservoir management and exploration, 3-D Seismic technology, high-grade petroleum coke upgrading and sulfur removal. Headquartered in Houston, Texas, the company has assets of $143 billion. ConocoPhillips stock is listed on the New York Stock Exchange under the symbol "COP." Conoco was founded on November 25, 1875, as the Continental Oil and Transportation Company, to sell kerosene in Utah. Its founder, Isaac E. Blake, had observed that the people in Ogden, Utah, still used candles and whale oil to light their homes because kerosene hauled in wagons from a primitive refinery in Colorado was too expensive. Blake believed he could lower the price by importing kerosene from refineries in the East by railroad. Later, Blake constructed the first pipeline in California from a railroad station in Pico to Ventura, where oil was loaded onto steamers and carried to San Francisco for sale. New petroleum products were introduced, including benzene to clean stoves, candles, ready-mixed paints, hoof oil for horses and a medicinal ointment. In 1885, Standard Oil took control of Continental but was made to relinquish it in 1913 by antitrust legislation, enforced by an order of the U.S. Supreme Court. Continental was then the top seller of petroleum products in the Rocky Mountain region, refining much of its output into gasoline to fuel the ever-growing number of automobiles. Continental built the first gas station in the West in 1909 and commissioned a fleet of delivery trucks, each with three separate tanks to transport different types of fuel. From 1909 to 1939, the company built more than 1,000 service stations in 15 states, each bearing the logo of a Continental soldier. In 1911, E.W Marland struck oil on land leased from the Ponca Indian tribe in Oklahoma. He quickly built a small refinery to process the crude oil, and founded the Marland Oil Company to market the refined output and build hundreds of service stations. Oil wells were drilled all over the region, including at the giant Burbank and Tonkawa fields. Marland established the first research division in the oil industry, which developed seismography techniques and new drilling methods. In the late-1920s, financier J.P. Morgan Jr. obtained control of the Marland Oil board when he provided the company with a $5 million line of credit. In 1928, when profits dropped, E.W. Marland was replaced as president by Dan Moran, a Texaco vice president. On June 26, 1929, Marland Oil Company acquired the assets (subject to liabilities) of Continental Oil Company for a consideration of 2,317,266 shares of stock. Marland Oil changed its name to Continental Oil Company and the main office was moved to Ponca City, Oklahoma. The acquisition gave Conoco the red triangle logo previously used by Marland, which became Conoco's logo from 1930 until 1970, when the current capsule logo was adopted. The new company now owned nearly 3,000 wells and thousands of retail outlets in 30 states. On September 15, 1929, one month after Conoco stock first traded on the New York Stock Exchange, the stock market crashed. The company cut salaries, sold off marginal oil fields and abandoned exploration projects. In spite of difficult economic times, Conoco expanded its refinery capacity, built the Great Lakes pipeline connecting Ponca City with Chicago, and funded many new products, among them the first lubricant to reduce engine friction. Conoco implemented marketing programs, like "Gentlemen Prefer Bronze," the advertisement for its newest gasoline brand, and the Conoco Travel Bureau, which gave out free travel information marked with the location of Conoco service stations. During World War II, Conoco become a key supplier to the United States government, operating a separate refinery to manufacture high-octane aviation gasoline. When many Conoco employees joined the military, more than 1,000 women were hired, many of whom wore blue denim overalls with the trademark Conoco red triangle. After World War II, Conoco established a new $2 million research facility in Ponca City, expanded refineries in Ponca City, Baltimore, Denver and Lake Charles, and erected a new refinery in Billings, Montana. Oil was discovered overseas in Libya and Dubai. To retail this oil, Conoco acquired a network of service stations in West Germany, Austria, Belgium, Luxembourg, and the United Kingdom, each marketing different Conoco gasoline brands. By 1972, Conoco had diversified into coal, chemicals, plastics, fertilizers and minerals, and held more than $2.3 billion in assets. In the 1970s, the U.S. oil industry was challenged by two Arab oil embargoes. The Organization of Petroleum Exporting Countries (OPEC) severely curtailed its oil output, quadrupling the cost of crude. Public outrage in the United States prompted intense government scrutiny and the U.S. Congress required oil companies to freeze prices and imposed onerous reporting rules and regulations. The increase in the price of gasoline gave Conoco the financial resources to search for oil in Indonesia, the Gulf of Mexico and the North Sea. Research efforts resulted in new technologies to force additional oil out of older, nearly depleted wells, as well as innovative synthetic and coal-based energy alternatives to oil. In the spring of 1981, Canada's Dome Petroleum made overtures to buy Hudson's Bay Oil and Gas, a Conoco subsidiary. This proposal sparked hostile takeover bids from many companies. Rich in cash and wanting to diversify, Seagram Company Ltd. engineered a takeover of Conoco Inc. through a tender offer to shareholders. When Seagram acquired a 32.2 percent stake in Conoco, DuPont was brought in as a white knight by the oil company and entered the bidding war. DuPont acquired 100 percent of Conoco's stock in for about US$7.4 billion, the largest merger in U.S. history at the time. On September 30, 1981, Conoco became a wholly owned DuPont subsidiary. In exchange for its stake in Conoco Inc, Seagram became a 24.3 percent owner of DuPont. By 1995, Seagram was DuPont's largest single shareholder, with four seats on the board of directors. In 1987, Conoco found major gas deposits in the North Sea's "V" fields, christened by Prime Minister Margaret Thatcher in September 1988. Tension-leg (TLP) floating oil platforms, derived from government studies on floating airfields, were constructed in both the North Sea and the Gulf of Mexico. An innovation in the oil industry, they permitted deep-water production at less cost than conventional fixed production platforms. From 1990-1997, the company expanded its upstream and downstream presence in new regions of the world, investing in the development of several major projects including Petrozuata, a mammoth oil project in Venezuela; Polar Lights, an oilfield development in Russia; and Britannia, a large gas discovery in the North Sea. During the 1990s, DuPont and Conoco began to pursue divergent corporate strategies; DuPont was evolving into a life sciences company concentrated on biotechnology rather than petrochemicals, and Conoco sought financial independence to make significant investments in foreign assets. In 1997, DuPont's board of directors agreed that an independent Conoco would benefit both the companies and their shareholders. Though the stock market and oil industry were both in upheaval, and the interest in new public offering was low, Conoco conducted an extensive public relations campaign to sell itself to the investment community. In October 1998, when stock in the newly organized Continental Oil Company went on sale using a new trading symbol, "COC," its IPO (initial public offering) was the largest in history, nearly $4.4 billion. In 2002, Conoco bought what was left of Gulf Oil's Canadian operations and merged with Phillips 66. Phillips 66 had been established in 1917, by L. E. and Frank Phillips. The two brothers had discovered several oil wells but had been on the verge of leaving the oil industry to start a bank when World War I began and the price of oil shot up from 40 cents to $1 a barrel. The two consolidated their holdings in Oklahoma and Kansas and established Phillips Petroleum Company. The merger of Conoco and Phillips 66 created the sixth-largest publicly traded oil company in the world and the third-largest in the United States. 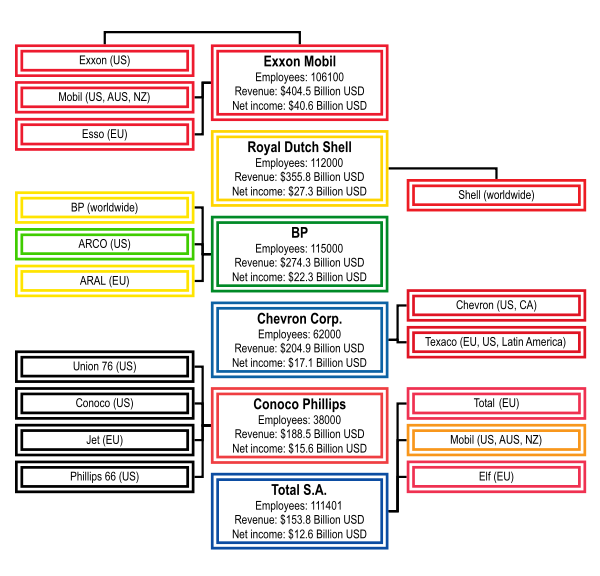 The merged company was named ConocoPhillips. In 2005, the corporation began rebranding its (Union) 76 gas stations, prompting a petition campaign by fans hoping to save the historic 76 orange ball signage. On January 20, 2007, a Wall Street Journal article about the petition campaign announced that ConocoPhillips was changing course and would be saving several dozen orange and blue 76 Balls to give to museums, as well as fabricating about one hundred spherical 76-logo signs in the ConocoPhillips color scheme of red and blue, to be placed at select 76 stations. In March 2006, ConocoPhillips bought Wilhelmshavener Raffineriegesellschaft mbH in Germany and Burlington Resources in the United States. ConocoPhillips is a vertically integrated business involved in every aspect of energy production, from exploration to marketing and delivery of energy to individuals and businesses worldwide. ConocoPhillips’ Exploration and Production division explores for and produces oil, natural gas and natural gas liquids around the world. As of December 31, 2007, the company had exploration operations in 23 countries and production in 16 countries. ConocoPhillips is the second-largest refiner in the United States and the fifth-largest non-governmental controlled refiner in the world. As of December 31, 2007, ConocoPhillips operated 19 refineries around the world, including 12 in the United States, six in Europe and one in Asia. As of January 2008, the company’s worldwide refining capacity was 2.7 million BPD. In the United States, the company operates Conoco, Phillips 66, and (Union) 76 (which was part of Unocal for many years, later a Tosco brand before that company was bought by Phillips) retail gas stations. In Europe, it operates Jet filling stations in Austria, Belgium, the Czech Republic, Denmark, Finland, Germany, Hungary, Norway, Poland, Slovakia, Sweden, Thailand, and the United Kingdom. ProJET was the brand operated in Malaysia, Turkpetrol in Turkey, and COOP in Switzerland. * Denotes joint ventures. Crude capacity reflects that proportion. ConocoPhillips gathers and processes natural gas, and transports and markets liquid natural gas (LNG). In North America, these operations are conducted through ConocoPhillips’ 50 percent interest in DCP Midstream, LLC. As of December 2007, the company had 63 natural gas processing plants and 58,000 miles of gathering lines. ConocoPhillips participates in chemicals and plastics production worldwide through a 50 percent interest in Chevron Phillips Chemical Company LLC (CPChem) , one of the world’s largest producers of olefins, polyolefins, aromatics and styrenics, piping and proprietary plastics. As of December 2007, CPChem had six research and technology centers and 36 production facilities in seven countries. With operations in nearly 40 countries, ConocoPhillips is committed to contributing to social, economic and environmental improvements in all the communities in which it operates. The company is currently funding numerous environmental, social, health and education programs around the world. In 2006, ConocoPhillips provided more than $22 million to support educational programs. In 2008, the company partnered with the National Energy Education Development (NEED) project to foster energy education and create awareness in America’s classrooms of today’s energy challenges and the importance of using energy wisely. In 2008, ConocoPhillips funded the expansion of Rice University's Elementary Model Science Lab (REMSL), a program that promotes science education by training elementary school teachers to explore the latest science concepts and learn new teaching methods. The program is guided by research showing that if students do not develop an interest in science by the fifth grade, they are unlikely to develop an interest in science at all. For more than 25 years, ConocoPhillips has been producing quality educational videos and teachers’ guides on math, science and environmental topics. Since 1998, ConocoPhillips has partnered with the State Environmental Protection Bureau of China and Municipal Environmental Protection Bureaus to provide Chinese elementary and secondary students with specific educational information on the environmental conditions that affect their lives, hands-on experience and experiments and workshops to creatively foster their concern for the environment. In 1990, Conoco announced that it would use only double-hulled tankers to transport oil, well before the industry was required by law to do so. On April 11, 2007, ConocoPhillips became the first U.S. oil company to join the U.S. Climate Action Partnership, an alliance of big business and environmental groups that in January sent a letter to President George W. Bush stating that mandatory emissions caps are needed to reduce the flow of carbon dioxide and other heat-trapping gases into the atmosphere. ConocoPhillips announced that it was spending $150 million during 2007 on the research and development of new energy sources and technologies, 50 percent increase in spending from 2006. A recent University of Massachusetts study has ranked ConocoPhillips third among U.S. corporate producers of air pollution. According to the researchers, ConocoPhillips facilities release more than eight million pounds of toxic chemicals annually into the air. The United States Environmental Protection Agency documents link ConocoPhillips to 52 Superfund toxic waste cleanup sites. In 2003, ConocoPhillips was named as a defendant in a lawsuit brought by a Georgian environmental group called Green Alternative. The suit claimed that a number of foreign oil companies colluded with the Georgian government to induce authorities to approve a $3 billion pipeline without properly evaluating environmental impact. ↑ Conoco Phillips, Company History. Retrieved February 25, 2009. ↑ 2.0 2.1 ConocoPhillips, Who We Are. Retrieved February 16, 2009. ↑ 3.0 3.1 3.2 3.3 3.4 3.5 3.6 3.7 Conocophillips.com, History. Retrieved February 16, 2009. ↑ Save the 76 Ball, Save the 76 Ball website. Retrieved February 16, 2009. ↑ 5.0 5.1 5.2 ConocoPhillips, Our Business. Retrieved February 16, 2009. ↑ 6.0 6.1 ConocoPhillips, Education. Retrieved February 16, 2009. ↑ University of Massachuessetts, Political Economy Research Institute Retrieved February 16, 2009. ↑ Bizjournals, Houston Business Journal. Retrieved February 16, 2009. Banham, Russ. Conoco: 125 Years of Energy. Lyme, Conn: Greenwich, 2000. ISBN 9780944641385. Chapman, Keith. North Sea Oil and Gas: A Geographical Perspective. Newton Abbot: David and Charles. 1976. ISBN 9780415447546. Continental Oil Company. 1955. A History of Conoco Seismic Development. S.l: Continental Oil Co.
ConocoPhillips. Fact Book: Opportunity, Performance, Value. Houston, TX: ConocoPhillips, 2007. Darden, Bob, and P. J. Richardson. Corporate Giants: Personal Stories of Faith and Finance. Grand Rapids, MI: F.H. Revell, 2002. ISBN 9780800717872. Finney, Robert. Phillips, the First 66 Years. Bartlesville, OK: Phillips Petroleum Co. 1983., ISBN 9780961114602. Mathews, John Joseph. E. W. Marland: Life and Death of an Oil Man. Norman: University of Oklahoma Press, 1951. ISBN 0806112887. Searcy, Frank. Geophysics—the First Fifty Years. Houston: Continental Oil Co., 1975. This page was last modified on 20 March 2017, at 16:11.